South Florida is filled with beautiful, breath-taking scenery and wildlife, as well as fun and exciting things to do. Kayaking and paddleboarding are great ways to see sights that you can’t get to when you’re landlocked. It’s also a wonderful way to exercise, engaging your core muscles and arms, and simply enjoy the great outdoors. This list also works for those interested in canoeing and other related water sports. If you’re in or around the Miami area and looking to hit the water, be sure check out some of these popular kayaking spots. This well-known river, stretching through both Palm Beach county and Martin county, is one of the few National Wild and Scenic Rivers, a national designation for particularly spectacular rivers that have been left natural and relatively untouched. The Loxahatchee offers kayakers an extremely authentic and genuine look at the true beauty of south Florida. The 8.5 mile stretch of the Loxahatchee River available for paddlers is one of the most beautiful kayaking spots in Florida. Whiskey Creek in Dr. Von D. Mizell-Eula Johnson State Park (which you may know by its former name, John U. Lloyd Beach State Park) at Dania Beach is a quaint little kayaking spot. It’s mostly unknown, so you’ll likely have the water (at least mostly) to yourself. The creek connects to the intracoastal, giving kayakers access to the creek, the river, and the ocean. This oasis is just a few minutes away from the busy streets of Miami. Because of its close location, it’s a favorite among many Miami public parks. This is an urban kayak trail, with condos visible and planes often flying overhead. However, the water is pristine and beautiful, and kayakers can take in a ton of the beautiful Miami palms that give the city its iconic look. The Middle River in Fort Lauderdale is a perfect kayaking location for beginners and casual kayakers. It’s an easy paddle on calm water with nearly no boat traffic to churn up waves. While there’s lots of wildlife on view in Middle River, there are also many interesting houses on the banks to view. This is one of the best places to kayak in the most famous swamp in the country, Everglades National Park. This is one of the few places in the Everglades where the water is actually clear. If you’re a thrill-seeker, Nine Mile Pond is a great place to find massive alligators. This state park takes up a beautiful island off the coast of Florida near North Palm Beach. 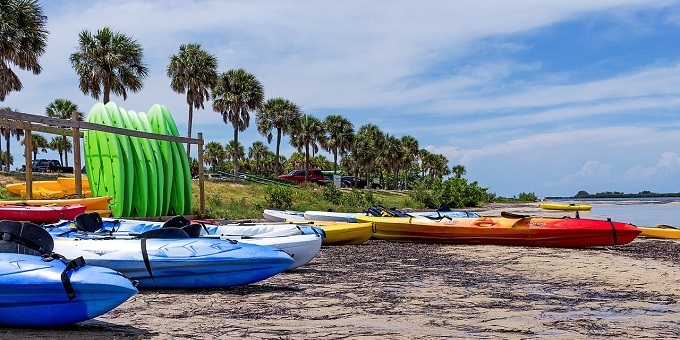 Kayaking around the mangrove forests and beaches of John D. MacArthur Beach State Park, one may find manatees, fish, birds, and beautiful native plant life. This kayaking adventure is great for birdwatching and bird enthusiasts. Indian Key is an abandoned island in the Florida Keys consumed by overgrown plants and ruins of the town that once stood there long ago. This historic island is easy to get to by kayaking through shallow water and over seagrasses, though watch out for the potentially treacherous rocky shoreline. Another Everglades National Park paddling spot, Bear Lake is a great place for a quick trip. It offers about 3 miles of canal to travel. If you’re looking to see some of the beautiful Everglades ecosystem that make the swampy park worth preserving, this is the trip for you. This river in Stuart is a lesser known kayaking spot. It’s untamed and swampy, filled with fun-to-navigate obstacles and beautiful foliage. It’s remote and great for paddlers who enjoy solitude. St. Lucie River is a great day getaway from the busy, urban scenes of Miami. The serenity and natural beauty of this spot can’t be beat. The New River runs right through the middle of Fort Lauderdale. Because it runs through the downtown of a big city, sections of this river are too busy with boat traffic to make for safe kayaking. However, the more secluded sections of the river provide beautiful urban scenes and a nice, historic paddle. If you are having a hard time deciding on which kayak to buy and where to search for it then check out the great list at smart-start-kayaking.com. This beautiful island is located directly across the peninsula from Miami. The Sandfly Loop kayak trail is a 5-mile trail around the island. The island itself offers picnic tables and hiking for a nice break from the paddling. There are lots of trails that weave through the island, making it a great place for running and walking or biking. Biscayne Bay is an exciting trip for kayakers of all kinds. This spot offers many unique takes on birdwatching. Within the bay is an active rookery that’s easy to paddle up to. It’s also easy to get to the beautiful Chicken Key by launching from Biscayne Bay. This island in the Florida Keys is popular for being home to the Key Deer, an endangered species of tiny island deer. While the deer are quite a sight, the real beauty of this key is the kayaking. Kayaking around the island is a beautiful, genuine, and natural paddle. Kayakers here are sure to see some Florida wildlife, like rays, Key Deer, birds, and crabs. Hells Bay is a twisting, curving, 10-mile long trail in the Everglades National Park. This trip is not for beginners; it’s long and difficult, though it is well-marked, so experienced kayakers may find the obstacles not too difficult to traverse. The launch for this trip is located somewhat far from the gear rental station, so be sure to bring your own for the sake of convenience. The unique thing about Bahia Honda Key is that the water here is exceptionally blue and crystal clear. This state park has several kayaking trails, so whether you have only a few hours, half a day, or a whole day to paddle, you’ll find what you want at Bahia Honda. This lake is located in a Broward County park. West Lake attracts large populations of a huge variety of birds because it’s home to the biggest mangrove forest in the 85-mile stretch between Miami Beach and West Palm Beach. Because of this location, West Lake is a natural, wild haven in an urban South Florida environment, making it a well-hidden gem. This Everglades river is a favorite among tourists and Miami natives alike. When you think of Everglades, you think of the scenes that fill Turner River: swamps, mangroves, sawgrass, marshes, fish, birds, and alligators. All this and more can be found at Turner River. This popular spot can get busy, so prepare accordingly. This state park is located in the Florida Keys in Key Largo. The entire state park is underwater and protects the sole living coral reef in the continental United States. There is a 2½-mile long trail here through calm, private waters and beautiful Florida mangroves, and the ocean is nearby for those who prefer ocean paddling. This Everglades National Park trail is a much easier paddle than Hells Bay, for those visitors looking for something a little more casual. This short, less than 2-mile trip hugs mangroves and banking twists and turns. The trail is overflowing with beautiful, luscious Everglades plants that are impossible to find anywhere outside of South Florida. This spring is located about an hour north of Tampa, so it’s a bit far from Miami. However, it’s definitely worth the drive. This historic park has been the site of underwater mermaid shows (a tradition that has survived to this day), stunning views, and picturesque water. Weeki Wachee is extremely popular, so if you’re looking for solitude, you won’t find it here; the park limits only 70 kayaks on the water at a time and is usually pretty packed. If you’re game for a bit of a drive, Rainbow River, stemming from a natural spring in Rainbow Springs State Park in Dunnellon, is an amazing Florida treasure. The water is absolutely breathtaking; it’s wonderfully clear, full of fish and grass, and always the perfect temperature. While Rainbow River is better known for tubing, paddlers will find this 6.5-mile trail makes for a unique kayak you won’t soon forget. This is also the best spot on this list to find rare Florida otters. Be sure check out our Kayaking in Miami page for a full list of kayak & paddleboard shops, rental locations, boat launches and more. 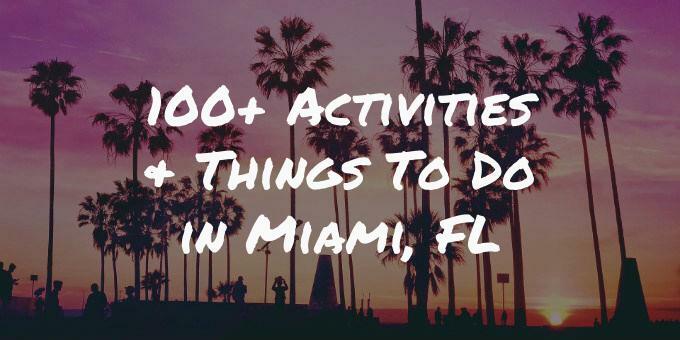 To explore other sports, fitness and recreational opportunities in South Florida, visit our comprehensive Miami Activities Directory and read our popular list of 100+ Activities & Things To Do in Miami, FL.